British Deputy Prime Minister Nick Clegg announces proposed changes to the UK political system one week after entering office. British coalition government proposes changes to "hand back power to people"
Clegg: "Taking people's freedom away didn't make our streets safer"
London, England (CNN) -- The new British government plans to replace the House of Lords with an elected second chamber of Parliament, Deputy Prime Minister Nick Clegg said Wednesday. The plan to replace the Lords -- whose membership was largely hereditary from the 15th Century until reforms introduced by Tony Blair's Labour government -- is part of a raft of proposals Clegg unveiled to overhaul British politics and "hand power back to people." Clegg also pledged to do away with plans for national identity cards and a second generation of biometric passports, and "properly" regulate surveillance cameras and the DNA database. Schools will not be allowed to take children's fingerprints without parental consent, and the government will review libel laws and limits to the right to peaceful protest, he said. "Britain must not be a country where our children grow up so used to their liberty being infringed that they expect it without question," Clegg said. He promised to get rid of "unnecessary laws" and introduce a mechanism to block "pointless new criminal offenses," saying "thousands" of such offenses were created under the previous government of Prime Minister Gordon Brown. "Taking people's freedom away didn't make our streets safer," Clegg said. "Obsessive lawmaking simply makes criminals out of ordinary people." 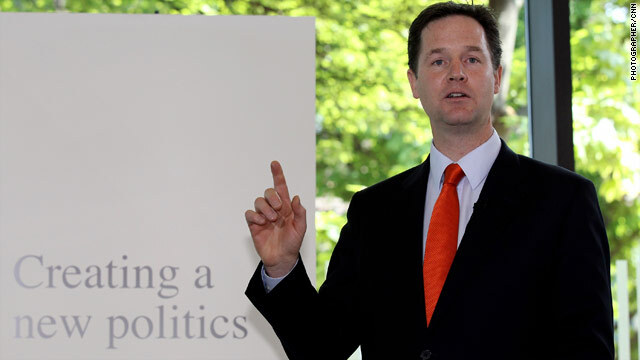 Representatives of the campaign group NO2ID, which opposes national identity cards, the DNA database and other identity management plans, noted that Clegg's Liberal Democrat party has long supported the ideas he proposed Wednesday. Group spokesman Michael Parker said it was "good to hear" Clegg making the proposals now that they are in government with the Conservative Party, which was more reluctant to accept the changes. The two parties entered a coalition government last week. "Sadly, there remains a great deal more work to do, because although the identity register and the ID card scheme were particularly pernicious, there are many other database state policies that need to be torn up as well," Parker said. But "it's heartening to see the new government is getting to work straightaway," he said. "We hope they'll continue in the same line to address the other problems." Clegg also focused on anti-terrorism legislation, which currently allows terrorism suspects to be held for as long as 28 days without charge. The new government will review current powers and legislation, he said, though he didn't specifically mention the detention limits. "There have been too many cases of individuals being denied their rights and whole communities being placed under suspicion," he said. Reform of the House of Lords was another major part of Clegg's reform agenda, but other political changes will involve regulation of lobbying, a reform of political party funding and tackling electoral fraud, Clegg said. The government will also have a referendum on introducing a new voting system, he said. Currently, members of Parliament are elected under a system called first-past-the-post, meaning the candidate who receives the most votes wins, regardless of whether they receive a majority. It has been criticized for denying representation to many voters, because it can mean that more people in a constituency vote for losing candidates than vote for the winner. The referendum will be on introducing the alternative vote system, in which voters mark candidates in order of preference, and the person who receives a majority wins. If no candidate wins a majority, "then the second-preference votes of the candidate who finished last on the first count are redistributed. This process is repeated until someone gets over 50 percent," Britain's Electoral Reform Society says on its website. "This government is going to transform our politics so that the state has far less control over you, and you have far more control over the state," Clegg said.